The back-to-school basic for students of all ages. Quality, wide-ruled paper makes note taking easy. Pad Type: Composition; Sheet Size: 8 1/2" x 7"; Ruling: Wide; Number of Sheets per Pad: 48. Eight sheet, 16-page exam books with stapled construction. Wide rule with margins. Pad Type: Exam; Sheet Size: 11" x 8 1/2"; Ruling: Legal; Number of Sheets per Pad: 8. This examination book has a flexible blue stapled cover. Wide rule paper with margins. Pad Type: Notebook; Sheet Size: 8 1/2" x 7"; Ruling: Legal; Number of Sheets per Pad: 8. This examination book has a flexible blue stapled cover. Wide rule paper with margins. Pad Type: Notebook; Sheet Size: 8 1/2" x 7"; Ruling: Legal; Number of Sheets per Pad: 4. This examination book has a flexible blue stapled cover. Wide rule paper with margins. Pad Type: Notebook; Sheet Size: 8 1/2" x 7"; Ruling: Legal; Number of Sheets per Pad: 12. 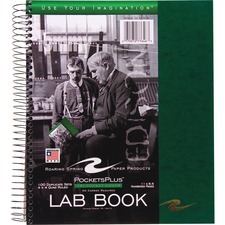 Pockets Plus Lab Book includes a tri-pocket cover and 100 quad-ruled duplicated sets with no carbon required. The pages are numbered and wirebound.